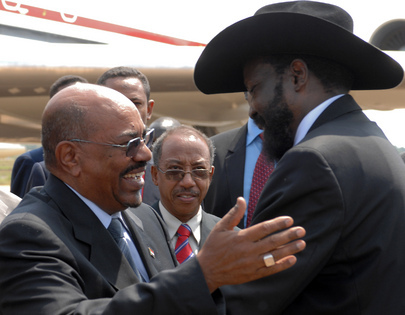 UNITED NATIONS, July 11, updated -- On Friday, the eve of South Sudan's independence, the UN Security Council met at 5 pm to consider a draft resolution “liquidating” the old UN Mission in Sudan, UNMIS, after having formed a new UNMISS only south of the border. Several Council sources told Inner City Press that this wind-down resolution might allow for the retention of some UN peacekeeping presence in conflict plagued Southern Kordofan and Blue Nile, at least during the wrap up period. We're just waiting for Russia and China to get instructions, several sources told Inner City Press on Friday evening, saying it might be adopted on Saturday at 11 am. But at that time, the Security Council was closed, and there was no announcement over the weekend. On Monday morning a Western spokesperson told the Press that the draft would set the end of August as the deadline, and that the draft mostly reiterates what is in the Status of Forces Agreement, or SOFA. But a source on the Northern side told Inner City Press there is “an issue with Paragraph six,” in which the Council would express its willingness to stay in Southern Kordofan and Blue Nile. Meanwhile bombs are being dropped on the Nuba people. Update of 11:28 am -- look like the fix is in. China rep tells Inner City Press have agreed to language about the UN being ready to provide assistance “upon the consent” of the parties. Should be adopted after the morning's Libya briefing by Al-Khatib. UNITED NATIONS, July 6, updated -- With the countdown to South Sudan's formal declaration of independence on July 9 begun, at the UN in New York on Wednesday negotiations on the resolution for a new peacekeeping mission went into overtime. A Deputy Permanent Representative emerged from the Security Council chamber and told Inner City Press that while the size of the mission will be reconsidered after three or six months, a sticking point is whether and how the disputed borders in South Kordofan and Blue Nile states will be monitored. 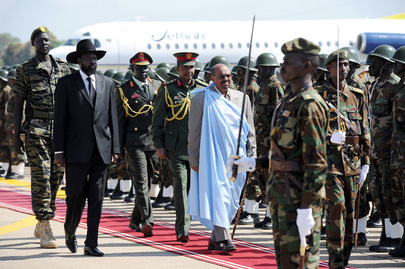 Khartoum has agreed to Ethiopian troops in Abyei, but has stepped away from a deal about South Kordofan. When Inner City Press asked the UN earlier on Wednesday to confirm troops build ups in South Kordofan, the response was a reiteration of Secretary General Ban Ki-moon's call for freedom of movement. Does that mean the UN doesn't have freedom of movement? Yes, was the answer. Video here, from Minute 47:30. On the numbers, a Permanent Representative inside the negotiations told Inner City Press that DPKO while asking for 7000 also refers to a 5400 figure. We'll have more on this. Update of 7:35 pm -- among Western P-5 Permanent Representative, the UK's Mark Lyall Grant emerged and told Inner City Press, somewhere between six and seven thousand. France's Gerard Araud said nothing. And Susan Rice of the US... is still inside the Council, if the presence of USUN body guards is any guide. Update of 8 pm -- the problem of adopting the resolution on Friday has apparently been solved: the resolution will say that the mission is created "upon" independence, and will be voted on Friday. The last of the diplomats have left.